While I haven’t mentioned my plans and thoughts for homeschooling in the future, I am planning to homeschool preschool, at least for now. I have felt more and more convicted to explore homeschooling and continue to feel drawn to the possibility of homeschooling my kiddos after preschool. I figure preschool is a good time for me to learn if I can really handle homeschooling. My kids are only 3 and 1, so we haven’t gone into preschool too much yet. I found the idea to do sensory tubs with Ethan on another blog, and I cannot find it right now, or I would link to it. Sensory tubs are pretty awesome for the three and four year old set. I imagine a two year old would enjoy one, too. 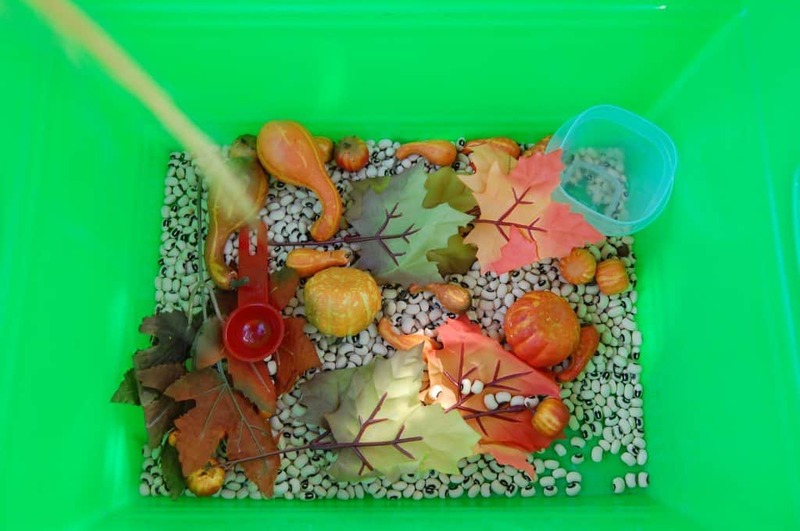 So, we made a fall-themed sensory tub. Edited to add: I finally found the blog where I first got this idea, on Pinterest of all places. 1+1+1=1 is another great resource for homeschool preschool ideas. I will be using a lot more of the ideas on this site in our home starting in November! 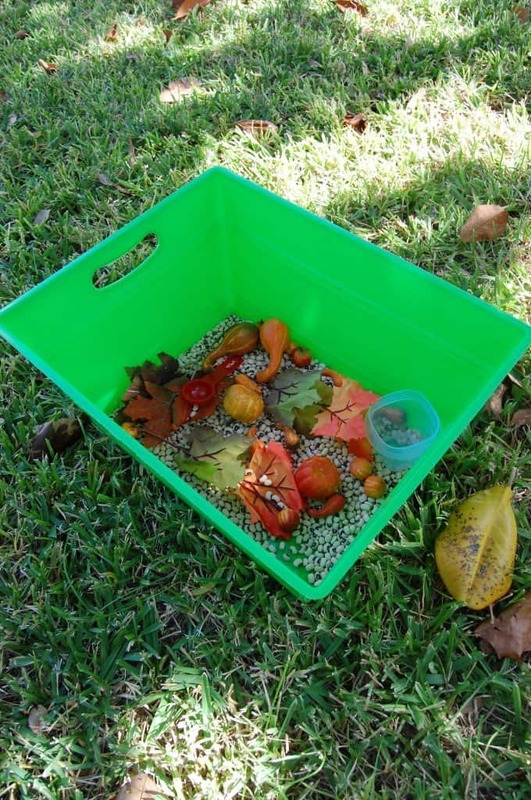 A sensory tub is just a tub full of stuff for little hands to explore, and it is inspired by the Montessori Method. I found a cheap, big tub at Target in the dollar section and it was perfect for our sensory tub time. I like to rotate my sensory tubs with the seasons and holidays. For example, our first sensory tub has a fall-theme. I put a bag of dried black-eyed peas into the bottom of the tub. Then I added some small pumpkins and gourds and silk fall leaves on top of the dried peas. There is so much more you could add to your sensory tub, just get creative and hit up the Dollar Tree! To encourage Ethan’s little hands, I added a scoop and a small cup. Since Audrey is still mouthing objects, Ethan is only allowed to play with his sensory tub when she is sleeping. He absolutely LOVES this thing. It could probably occupy him for hours! I like to put a blanket underneath the tub and just sit him down in the floor. He had a blast scooping and dumping. We talked about the fall leaves and a little bit about pumpkins and gourds. Next, I will probably add some trinkets related to Thanksgiving to the tub so we can talk about that. It really is a lot of fun to create a sensory tub and watch your child have a blast with it! Edited to add: Here is a link to the blog Counting Cocounts, which is a wonderful resource for sensory tub ideas. This is not the orginal blog I found where I got this idea, but it looks pretty awesome!